Jane's Addiction is an American alternative rock band from Los Angeles, California. Formed in 1985, the band's original lineup featured Perry Farrell (vocals), Dave Navarro (guitar), Eric Avery (bass) and Stephen Perkins (drums). After breaking up in 1991, Jane's Addiction briefly reunited in 1997 and again in 2001; both times with Avery declining to participate. In 2008, the band's "classic" line-up, featuring Avery, reunited and embarked on a world tour. Avery subsequently left the band in early 2010 as the group began work on new material. Jane's Addiction was one of the first bands to emerge from the early 1990s alternative rock movement to gain mainstream media attention and commercial success in the United States. Their initial farewell tour launched the first Lollapalooza festival, an alternative rock showcase. 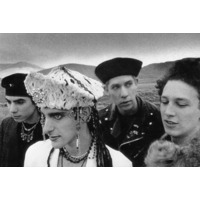 As a result, Jane's Addiction became icons of what Farrell dubbed the "Alternative Nation". The band was ranked 35th on VH1's "100 Greatest Artists of Hard Rock" list.